This deserves all the praise we can offer. 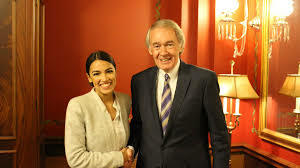 Finally we’re talking about a real policy approach to the looming catastrophe of climate change: Today our junior Senator Ed Markey and the instant-superstar Congresswoman Alexandria Ocasio-Cortez introduce the outlines of a Green New Deal. You can read the whole thing here. It begins with a strong statement of necessity: The dire consequences of our past inaction that we are facing right now, and how much worse things will get. And it addresses not just the threat of climate change, but the ongoing economic dislocation caused by an industrial-policy-by-default, favoring the extremely wealthy at everyone else’s expense. Ocasio-Cortez said in a statement that the plan will create ‘‘unprecedented levels of prosperity and wealth for all while ensuring economic and environmental justice and security.’’ She calls for a ‘‘World War II-scale mobilization’’ that includes high-quality education and health care, clean air and water and safe, affordable housing. Answering critics who call the plan unrealistic, Ocasio-Cortez says that when President John F. Kennedy wanted to go to the moon by the end of the 1960s, ‘‘people said it was impossible.’’ She also cites Franklin D. Roosevelt’s New Deal, Lyndon B. Johnson’s Great Society and the interstate highway system begun under Dwight D. Eisenhower as examples of American know-how and capability. I’ll add, to anyone who calls this plan “unrealistic”: How do you expect to live on this planet, to continue human civilization, without such a plan? Who’s realistic? Shall we recall the physical, real-life context of this proposal? The last four years are the warmest on record, and two major scientific institutions are predicting the next five will be even hotter. We have suffered enormous losses of life and money, which will get worse and worse, and eventually, irreversible on any time scale we can imagine. Friends in Massachusetts, this is why we put Ed Markey in the Senate. Markey has been on the climate beat since there was one, for thirty-plus years now. He is philosophically progressive, he knows the issue better than anyone, and he knows how to legislate: He wrote the climate legislation that actually passed the House in 2010. This proposal, this moment, is his raison-d’etre, his calling. Buoyed by the arrival of the electric, visionary Ocasio-Cortez, this wily veteran’s ship has finally come in. He is old school and tells corny jokes, but let it never be said that he is too old, irrelevant, or out of touch. Right now, he is the man on the scene, and the whole of planet Earth and human civilization depends on his good work. He is the right person in the right place. I ask folks in the press to map the proposal onto the ongoing threat of climate catastrophe, not merely the politics of the moment. Voters and politicians can change; the laws of physics do not. There are two questions: Will it save the planet for our children? and then, Will it pass? Our political press is eager to answer the second question for us before even mentioning the first. Again, let’s be realistic: How can we possibly manage without a Green New Deal? The answer is unthinkable. This is a necessity — and absolutely a mandatory litmus test for 2020 Democratic candidates. I note that because neither of the principals are running for higher office, there are no distracting “concerns” about the sincerity of their interest. Instead the focus will remain, as it should, squarely on the merits of the proposal. In a more perfect world, I would like to be helping our senior Senator make her much-needed wealth tax become law while helping our junior Senator make this equally urgent “Green New Deal” proposal become national policy. Surely these issues are a better use for our time and energy than the perpetual circus about events of decades ago, sarcastic hand-claps, and the gender and dress of our incoming Congress (no matter how entertaining). I’ve read the proposal and support it. I must also say that I’m profoundly disappointed by the outright distortions of the CNN coverage of this. I suggest that each of these is false. The CNN headline on the press conference given by Ms. Ocasio-Cortez and Mr. Markey (a 10:47 video that is well worth watching) is even more deceptive: “Ocasio-Cortez shrugs off Pelosi’s comments on ‘Green New Deal'”. Watch the video. Ms. Ocasio-Cortez does NOT “shrug off” or “brush off” (that was the earlier headline) Ms. Pelosi’s comments. Instead, she WELCOMES them. She and Mr. Markey compliment Ms. Pelosi and her long-time leadership on climate change issues. It’s as if CNN can’t believe and won’t report that Ms. Ocasio-Cortez and Mr. Markey like, respect, and welcome Ms. Pelosi’s comments and encouragement. Lost in the CNN fog is the reality of Ms. Pelosi’s many years of leadership on climate change issues. I’m left with the very distinct impression that the CNN headlines are, in essence, click-bait intended to inflame a conflict between Ms. Pelosi and Ms. Ocasio-Cortez — a conflict that doesn’t exist. I expect lies and disinformation from Fox. I expect more from CNN. It appears that CNN and our mass media would rather talk about fights, “identity politics”, and about invented conflict than actually REPORT the actual FACTS about what some of our elected officials are doing about what is arguably our most urgent issue. I am not surprised. I don’t expect fair dealing from the press (including most of the progressive press) any time the Washington consensus on economics or security is challenged in any meaningful way. Even the NYTimes focuses pretty much exclusively on the politics and will-it-pass stuff. 1. What does this proposal call for? 2. What is different about this proposal? 3. What problems does it address and how likely are its provisions to solve those problems? I find myself wondering if our press is so scientifically illiterate (or innumerate) that it literally cannot understand or convey anything substantive about this proposal. So it instead goes on and on about who likes whom and who will support whom and who did what to whom and all that other sausage-making stuff.